New rail fares have been introduced by Irish Rail. Across the network the average rail fare has increased by 6%. But although these fare increases have been approved by the National Transport Authority, there are some strange faults in the fare structure when comparing different trips. Twice the fare for the same distance travelled. 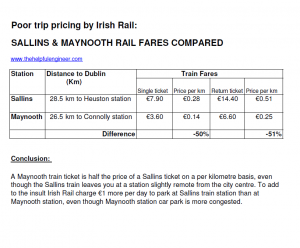 For example a train journey from Sallins to Dublin will cost twice the price of the similar length trip between Maynooth town and Dublin. This is stranger still when one considers that the Maynooth train brings the passenger straight into the heart of the City Centre. 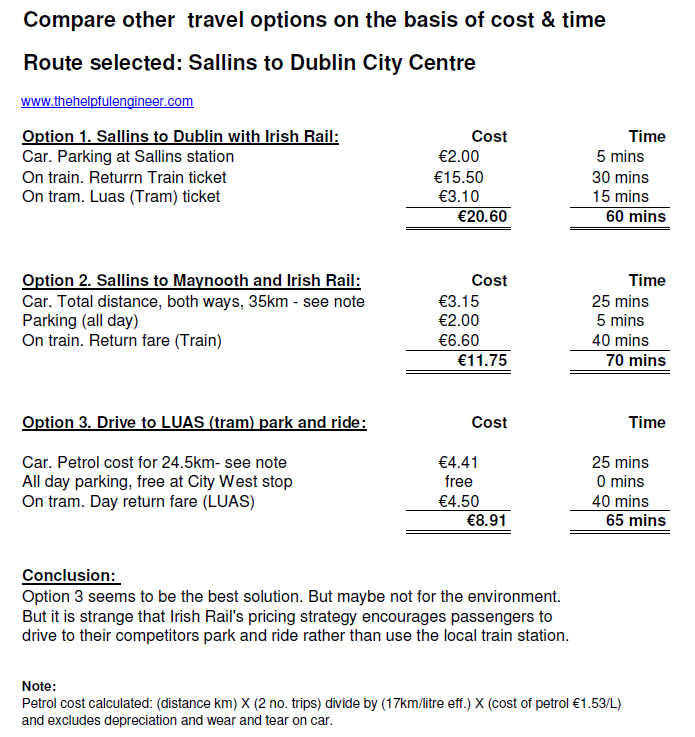 In contrast the Sallins train, remember twice the price, leaves the passenger at the edge of the City Centre in Heuston Station. See below and click to enlarge. Try a different route to avoid the high fares. Sallins, unlike Maynooth, does not have a bus service to Dublin. This lack of competition might explain why the train tickets are so expensive. But all is not lost; if the traveller has a car there are options available. 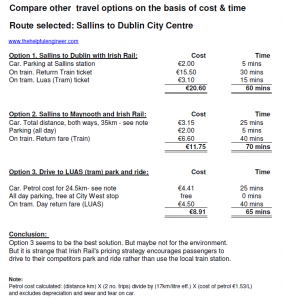 In fact for nearly half the price and the same travel time the passenger can drive 24.5km to one of Irish Rail’s competitors, the LUAS park and ride at the City West, and travel into Dublin from there. 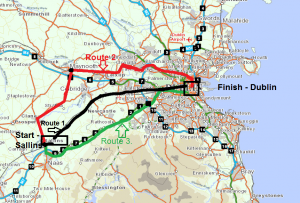 As another alternative route option, the passenger could keep their business with Irish Rail and drive the 17.5km to Maynooth, park there, and take the train. Even allowing for the added petrol expense, although not wear and tear, this would be cheaper but it would take more time. See options in detail below, click to enlarge. 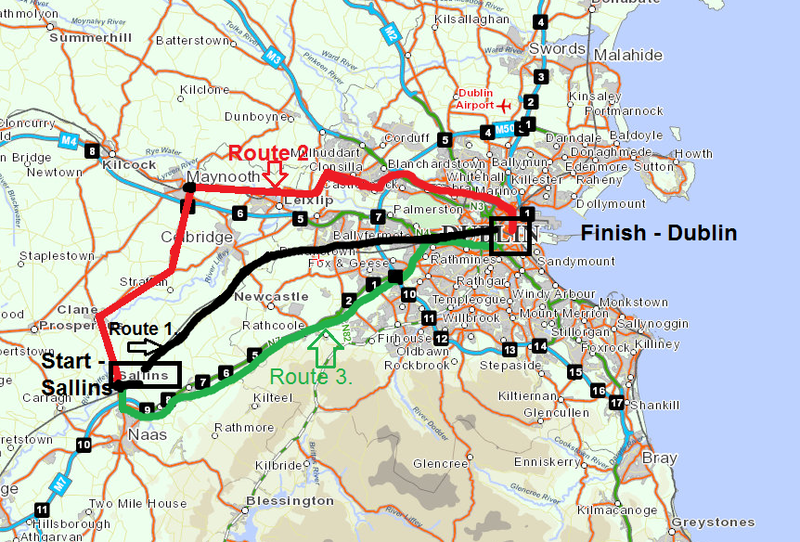 And the routes are mapped out below, again click to enlarge. Looking at other commuter towns the same problems are apparent. 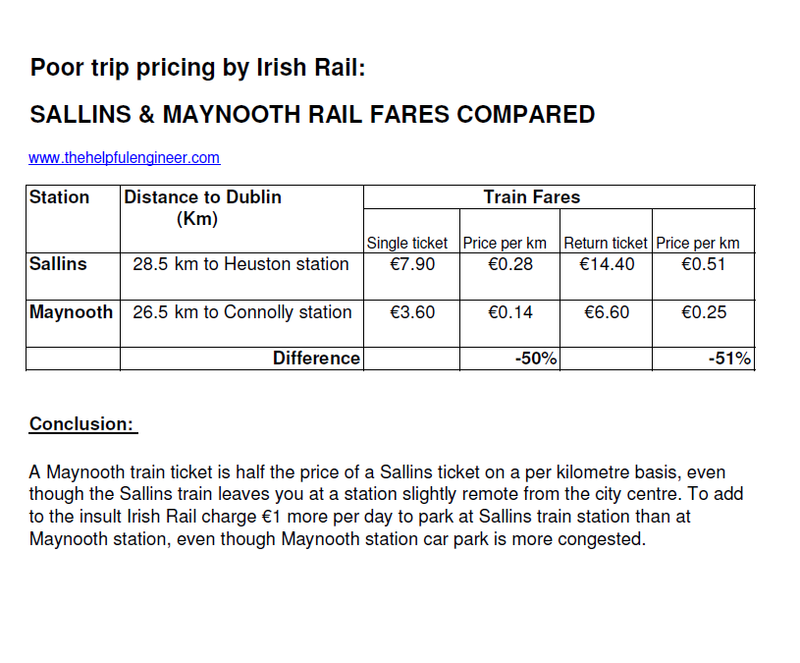 For example, the route Laytown to Dublin experiences a similar price per kilometre travelled as Sallins. In my opinion the fares should be consistent across the rail network and not favour particular areas already served by comprehensive and cheap public transport options. Click here for fare rates on the Irish rail website. Hi Bjg. That really doesn’t make sense either. A uniform and clear pricing structure is needed throughout the country. There is free parking for the luas at City West Shopping Centre (under ground car park), plus you don’t have to Newlands. Hi Enda. That’s a good point. I forget about the free parking there. That would make the LUAS option even more cost effective. Thanks. I will update the tables in the article. Hi. I have been outraged be this price increase and have written to NTA asking why such huge increase. It has to do with Sallins being classified as an Express route as it is on the Cork route. I outlined good few wholes in their logic using the information from the report that is the basis for this change, but they didn’t even care to address them. To me the only way to deal with this is to petition a change in Sallins designation. Or go with the alternatives outlined by you… I am up for a fight is anyone else is.